Leaking bath in Rice Lane L9. Bath out, floor up, damaged joists repaired, new marine ply floor and bath back in! Disabled installation for an old customer of ours. Electric Dyson air blade fitted , commercial non slip safety Lino , disabled toilet , disabled rails and panic alarm . Also this needed a purpose fitted drain. Job in Wigan town centre. Full Maintrade installation on Mather Avenue L19 in June. 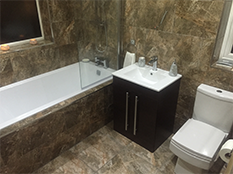 Full bathroom makeover in Hale L24 in April. Full design service and all works carried out by our team.